Yola – Vice-President Yemi Osinbajo on Saturday in Yola, reinstated the commitment of the Federation Government to keep one, indivisible Nigeria. 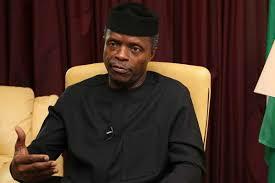 Vice President Yemi Osinbajo, SAN The vice-president, therefore, urged Nigerians to sustain the unity which he said was the dream of the fore fathers of the country. According to him, Christians are encouraged to pursue justice and reconciliation with people of other faith. While congratulating Filibus for being the first Nigerian and second African to emerge President of LWF, Osinbajo urged him to work toward uniting the church and promoting peace and love. “It is our role as Christians to bind people together and we must do so by self sacrifice and love. “On behalf of the Federal Government and Mr President, I wish you an excellence and God guided tenure as President of LWF.” Earlier, Gov. Mohammed Bindow of Adamawa, who also congratulated Filibus for his elevation and making the people of Adamawa and Nigeria proud, assured him of his administration’ support to succeed. In his remarks, Filibus thanked the government of Adamawa and Nigeria for standing behind him and urged more support and prayers for a successful tenure. Filibus vowed to make Nigeria proud by being a good ambassador. “I will stand to be one among many to prove that Nigeria stands tall among the comity of nations. “I give thanks to all who contributed in making me what I am today,” Filibus promised. The LWF is a global communion of 145 churches in the Lutheran tradition, representing over 75 million Christians in 98 countries. Other dignitaries that graced the occasion were, the Governor of Plateau, Mr Solomon Dalong, Mr David Babacir and representatives of the Speaker, House of Representatives, Governor of Taraba and his Benue counterpart.